For us, living is about dreaming, whatever form that might take, and the fascinating route to achieving those dreams. Back in 2009, we found our dream place right here, a Frisian farmhouse just below the Lauwersmeer, so we moved from the centre of Utrecht to Friesland. We quickly decided on the name ‘it Dreamlân’, which is ‘Dreamland’ in the local dialect. Our two boys also have Frisian names, Olke and Tjalle, and there are good reasons for this. Both names have roots in these vast beautiful mudflats, and we simply felt at home on this clayey soil. Our greatest dream at that time was to be able to spend much more time outside with the kids, away from the stress of the city. That dream came true immediately with the move here because living outdoors here is easy – to say the least! . It wasn’t long before a new dream arose. We enjoyed the beauty of this place so much, we decided we wanted to share it with others. When we bought our home here, it included a small natural campsite and a cosy holiday home. At the time, we thought it was a nice bonus. Step by step, we gradually made it our own and turned it into the informal and inspiring place it is today, where everyone can feel at home. We put our heart into this place, learned to love our land and shed a lot of blood and tears during its construction. Moreover, our third child was born: a Frisian ‘femke’ (lassie) called Jikke. Our three children are all real Frisians, and don’t plan on returning to the busy city . Shame that mum and dad occasionally long for a bit of city life and culture… Well, it’s not a problem, from time to time we get a babysitter in, then drive up to Groningen or Leeuwarden for some fun. Our guests almost always recommend our place to their friends and family, so ever more people want to come and stay here and camp. It’s a great feeling, knowing all those people are so enthusiastic about our dream location! We have expanded our site every year, and in 2015 we are completing the final stage with the construction of two beautifully designed barn-style buildings. One barn contains 4 holiday homes and a communal area, all under 1 roof, while the other barn is our new family home. It means that our former home, the Frisian farmhouse, can now be used as a beautiful family home for guests. We can now receive guests in the summer and in the winter: both real campers and those who prefer the luxury of a proper bed. And, most importantly, everyone enjoys coming here! Wow! There’s a big chance that we can once again dust off our dreamers’ project on further dividing up our land. 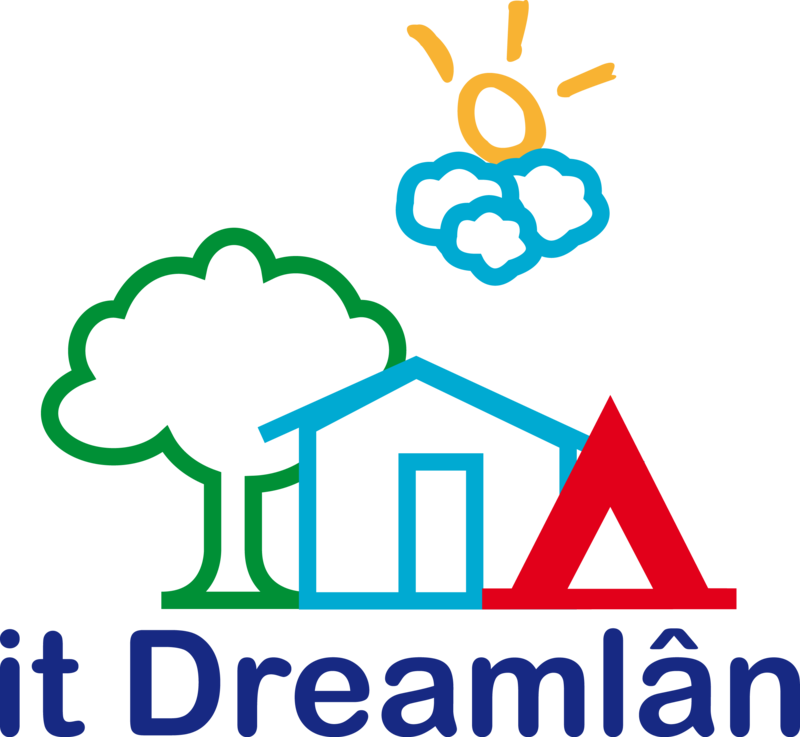 In 2012 and 2013, it Dreamlân offered dreamers a dream spot for a week, a place where they could peacefully work on their dreams. Why? We are simply interested in dreams and dreamers, and in particular those with the courage to make their dreams come true. it Dreamlân is now perfectly dimensioned and ideal for us, we don’t want anything bigger. Even so, we remain dreamers, so we will always be inventing new, creative things to do with our lives. Chasing your dreams does require courage and, whatever else is said about us, that is one of our core characteristics!